This homemade costume for women entered our 2015 Halloween Costume Contest, and won 2nd place in the Coolest Adult Costume nomination! This was the year I decided to pull off a costume I had been wanting to do for a long time. 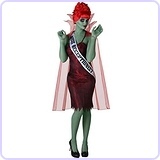 I had been "Miss Argentina" from the same movie, Beetlejuice, in the past and got a really good response. For the sofa, I made a frame out of PVC pipe and attached rolling caster wheels. I made the cushions out of cardboard and adhered a thin sheet of batting over top. I sewed fabric like a slip cover and glued it all down. I cut a hole in one side for me to pop up through the bottom and reveal only my upper half. The legs are from a mannequin supply store, already crossed with a torso. I used some of the extra batting and painted it red for the "cut". I spray painted the whole thing blue to match the body paint I was using. I found almost a perfect match for the fabric online, and using my mom's sewing machine made the collar, skirt and top. I ordered the beehive wig online. I used wire to keep the legs in place on the sofa. Turns out, this mannequin has my shoe size, and I used spray adhesive to keep the fishnet stockings in place. I marched in the NYC village parade with this and had a LOT of technical difficulty. But, the crowd didn't seem to mind too much. Thankfully, I have crafty friends who were able to come up with solutions in a pinch (such as, jamming paper into the wheel threads to keep them in). I got so many great responses, a lot of people exclaiming that my costume was the "best ever"! And a lot of people wanting to take my picture, and pose with me. The PVC and components were bought for maybe $15, the mannequin legs were $60, I had the cardboard and duct tape around the house. The fabric ordered online totaled $25 and the wig was $20. The makeup probably cost $20 more. Most creative I've seen ever! I love this Costume i wanna make it this year. How long did it take to make. Im not understanding the couch thing. Can u Email me back with more details. Please i like to enter contest every year. I was a Barbie in a Box last year. Can you sell it? I would like to have it. It's awesome.